Heart My Hobby: Baby Bud Designs Challenge #2 and Freebie Friday!!! Baby Bud Designs Challenge #2 and Freebie Friday!!! Welcome to another Friday Freebie here at Baby Bud Designs!!!! Make sure you click and save on him today and spread the word so you can all play along with us for our second challenge!!! ALSO, today marks the start of a brand new challenge! AND, as a very special thankyou to all of the people who played along, Mary Anne has decided to release a 2nd freebie for you today!!! The only rule we ask is that you use a Baby Bud Image!!! To kick off our first challenge ever we wanted to offer our huge prize package to as many people as possible so we had some different rules. But from now on, we wanna see those Baby Buds! We will always have our freebie giveaway on the same day as our challenge so everyone should be able to play along. We are also members of CDAC (Crafters Digital Art Centre) where you can access some of our other freebies as well. You have a whole month to play along again for our second challenge, the deadline for your cards and projects will be on November 24th at 12:00 noon E.S.T. The winner will be announced on November 25th 2010!!! The Prize???? 2 digi images of your choice from our Etsy Store and a card kit full of goodies!!! So with all that being said, here is my first card using Woof Doggie and the rules of this months challenge. I made the card for my sister, who just got married and doesn't have kids yet, but is getting a new puppy. 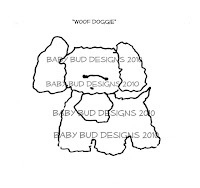 Woof doggie was colored with Copic markes and then covered with Flower Soft. Thank you for stopping by today and I look forward to seeing your creations with this months challenge. Oh, what a cute card, love the puppy, love the colors! your card is just so happy and fun! love the way you did your cute pup! Awww, so sweet! I like how the flower soft makes him look so fuzzy. this is so precious Calypso!!! I just love your flower soft puppy!